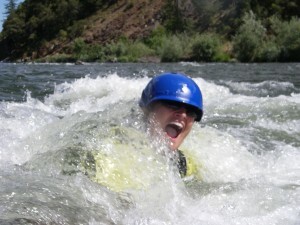 Home » swiftwater rescue » Strainers: Swiftwater rescue hazard! 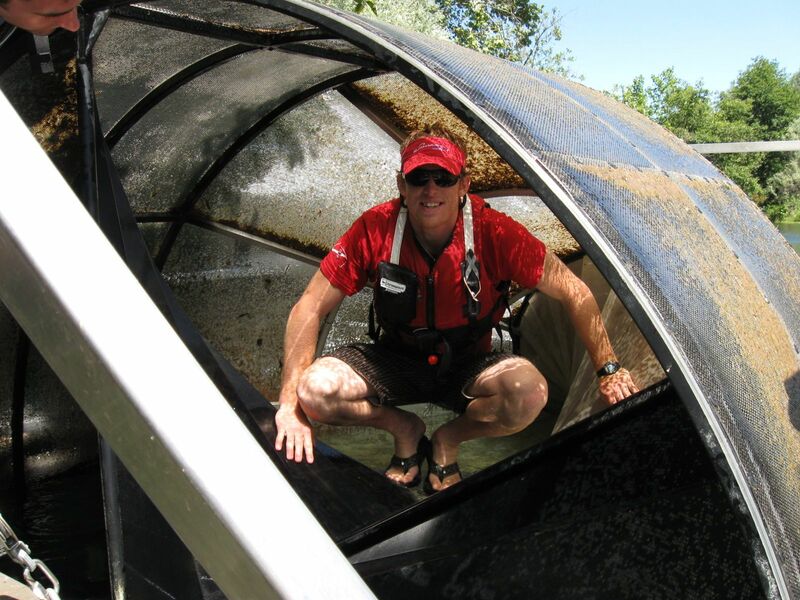 Strainers are one of the most dangerous features that are found on rivers. They can be invisible to the unsuspecting victim, and may be encountered by rafters, kayakers or rescuers when they aren’t expecting them. Strainers can be man-made objects or naturally occurring, but if you know what to look for, they can be easily recognized and avoided. A strainer is defined as anything that swiftwater can flow through, but that a swimmer, kayaker or boat cannot. Some examples include cars, trees, man-made obstacles and debris. Strainers are life-threatening obstacles that should be avoided whenever possible. A student in a Swiftwater Rescue class practices entrapment on a strainer. Try to swim away from or avoid the strainer. Recognizing the hazard is very important if you want to avoid it. If you can’t get away from the strainer, then turn over on to your belly with your face downstream and aggressively swim towards the strainer. Successfully getting over the strainer is a mix of timing, momentum and the strength to get your body over the obstacle. Place both hands onto the strainer and try to get your body as high up on the strainer as possible. At the same time you plant your hands on the strainer and push up, you want to kick hard. The two-legged “butterfly” kick works best. While combining the hand placement, push up and kick, you can try to launch your body over the top strainer. If you only get your body partially up on the strainer you may have to throw your body weight forward to get the last bit of thrust to get yourself over and clear of the hazard. 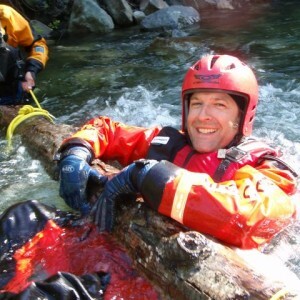 Getting over a strainer as a swimmer needs to be practiced in a controlled environment, such as in a swiftwater rescue course. Do NOT try to swim over a real strainer in any situation. Even the most benign looking strainer could pose a serious risk. A whitewater kayaker avoids a strainer by paddling away from it. This strainer is visible and easy to avoid, but logs under the water may be difficult to recognize. Strainers have different appearances depending on their orientation in the water. A log underwater poses a significant hazard to a swimmer, but may be invisible until it is encountered. Other strainers at water level may look like a horizon line, or a linear pour-over. 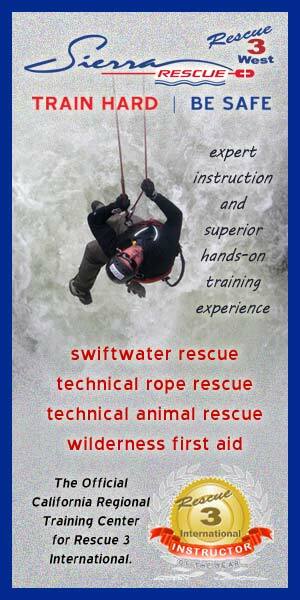 Recognizing these hazards is essential, and hazard recognition is taught in swiftwater rescue classes. If you aren’t familiar with how to identify a hazard, or know how to respond to an entrapped victim in a strainer, it is a good idea to take a swiftwater rescue course, or river rescue class from a certified instructor with Rescue 3 International. Man-made strainers, such as bridge pilings, fish traps, nets, and debris are also very dangerous and can entrap a boat or swimmer. 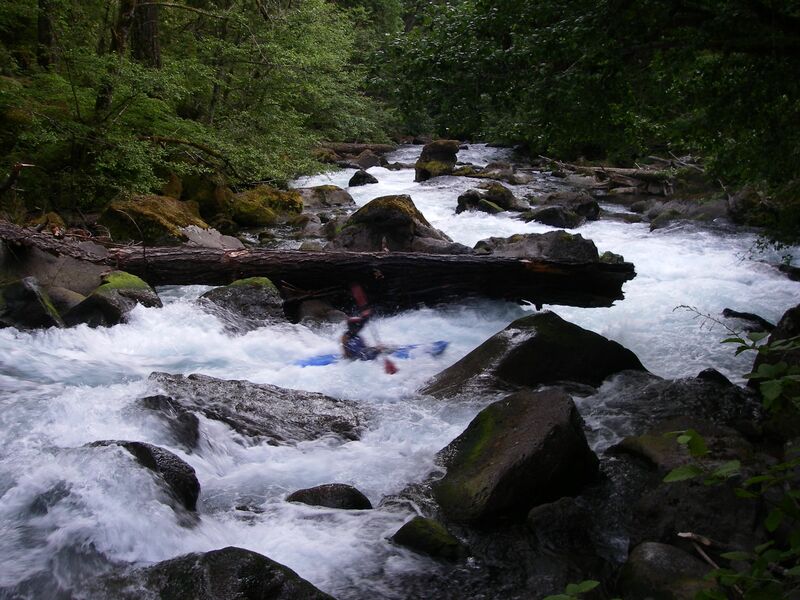 Be careful in rivers to know your hazards, where they are, and have a plan to avoid them before you come up to them. Sierra Rescue instructor Zach Byars examines a man-made strainer, a rotary fish trap. Clearly, this one is out of the water, but they can be very dangerous with a current running through them! With proper training, practice recognizing and avoiding, experience and good judgment, strainers can be easily avoided. With proper training you can be ready to rescue others who haven’t been successful in avoiding them!